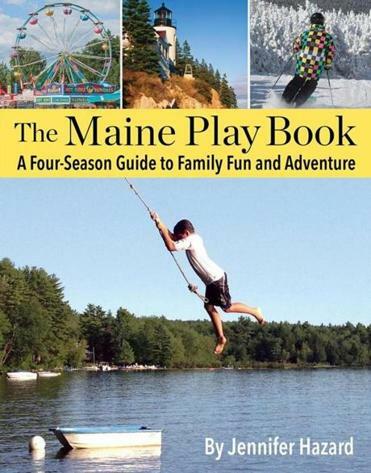 Summer is nearly over, but that doesn’t mean the fun has to end, at least not if you follow “The Maine Play Book: A Four-Season Guide to Family Fun and Adventure” (Islandport Press, $14.95). Written by Jennifer Hazard, who lives in Cumberland, the guidebook gives parents an insider’s perspective of the Pine Tree State. Hazard is the perfect guide, with years of touring experience, thanks to organizing year-round adventures with her daughter, 12, and son, 11. She also writes the blog “Cute Potato: Your Guide to Everything Kid-Friendly in Maine” and has served as a “Maine Insider” family travel expert with the Maine Office of Tourism. The “Maine Play Book” is organized by season, and each section features farms, nature preserves, and parks, as well as events and activities for families — from the rocky coast to the western mountains and up to the northernmost reaches of the state. Travel tips and beautiful color photos are sprinkled throughout the nearly 200 pages, including well-known spots and tucked-away gems. Hazard also provides a handy assortment of detailed day trip ideas, especially useful for full-day and weekend outings from the Boston area.